Kanella’s ethnic innards are advertised as housing a “Greek Cypriot Kitchen” which gives perspicuous homage to “the birthplace of Aphrodite.” You need not have viewed Botticelli’s Birth of Venus to instantly recognize an ivory white naked Aphrodite emerging in full frontal Cypriot femininity from a gigantic seashell. She was born from the foam of the waves off the coast of Cyprus and seemed to become grounded enough to endure puberty and become an adult goddess of love and fertility. Her spirit seems to imbue this restaurant. The reasonably priced neighborhood eatery has been a culinary BYOB blockbuster, ab ovo. 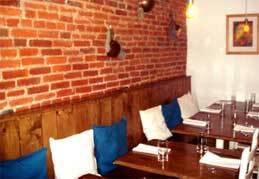 It has matured as the finest foray into Cypriot/Greek cuisine Philadelphia has ever mid-wifed. I first met Chef Konstantino Pitsillides preparing and serving a Grilled Halloumi Cheese appetizer when he had just begun a stunning stint cooking at the former “MEZE Mediterranean” on South 9th Street some years ago. The cheese was sharp, salty and golden, crisped to a seared tartness on top, sides and bottom. He watched as I placed a forkful between my lips grinding my molars to magnify the morsel’s molten momentum. My mouth glowed in praise even before swallowing. That same brined derivative of lamb’s milk is enviably concocted aside a cooling chopped salad as a “Starter” at Kanella, Pitsillides’ own brilliant establishment. 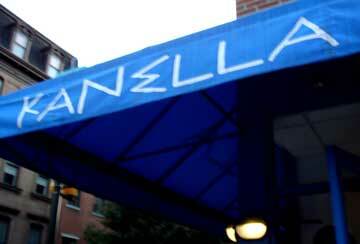 Enter the premises from under a sea blue overhead awning into a homey brick-walled venue with bare wooden tables to your left. There are blue and white pillows for back support interspersed along a room-length seating panel. A few copper pots adorn the bricks. Sparkling wine glasses and white napkins add to the austerity of the shined tables. Chairs on the other side of the tables are painted as white as Aphrodite’s nascent belly. Walls on all other sides are either island white or windowed, giving the sense of being in a Cypriot kafenes (coffee-house). Dips Of The Day With Grilled Pita Bread ($7) should start your salivation. A huddle of varied Mediterranean puddles is displayed on a long thin platter. Dip into a placidly oiled roasted red pepper mound positioned among sliced purple onion strands and Middle Eastern spices; or drenched-in-garlic scordalia mashed potatoes; or blanched and blackened silk-skinned eggplant ovals bathing in hot pepper flakes and cinnamon; or perhaps a dip of pounded black beans parsleyed perfectly and profusely. Your tongue swirls and sails past full, fresh flavors and fragrances. The unleavened flat pita bread has puffed from its grilling, ready now to allow an insertion of ingredients from a mint yogurt-cucumbered Tzadziki dip and a crushed sesame seed Tahini dip infused with garlic. 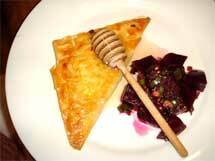 A sweeter beginning ought be with Bureki ($7), a phyllo pastry parcel stuffed with feta and thyme, then drizzled with thyme honey and served with glistening purple beets. The pastry is burnt amber in color, over which a dramatically placed honey- spindle rests laden with perfumed aromatic thick liquid. A mound of beets shares the round white plate, surprising you how such a strange plate-fellow complements the texture of thin phyllo. Never beware of Greeks bearing beets as gifts. If offered by your waitperson as an off-the-menu special, do not hesitate to order Greek Island Chips “for the table.” I don’t know what that might cost, nor should you care. A huge white bowl arrives loaded with thickly cut potato spears. The spuds look as if they’ve spent a night or two on a Spartan mountain top before having been seasoned for a life of Greek drama. They are redolent of heated oils, cilantro, peppercorns, garlic and hints of lemon and crushed cumin. Your belly begins to growl as if it had once been a hollow wooden Trojan horse. “Mains” are highlighted by Mousaka ($18), Filet of Fish of the Day ($ M.P.) or Moshari ($24). Here, Mousaka is vegetarian, served with a warm green bean salad. The oven baked classic is replete with traditional layers of potato, aubergine and sauces, rendered perfectly verdant beside a tangy brace of greenest beans topping salad pieces and rollicking radishes. The Moshari is grilled veal flank steak over wild mushrooms and calmer leafy spinach. There’s more than a half pound of veal lying in a medium rare state, resting in pieces stretched across a bed of fleshy fungi pillowed by the spinach. Other spritely colorful vegetables abound at will. 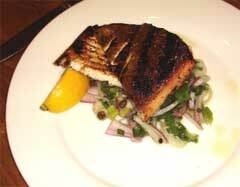 The Filet of the Day, Tiger Fish, was especially silky with a satin-sable flakiness. Potatoes and fava beans stand by. The charred skin of the fish remains on it when piled onto a red-hot platter, stunning its smokey flavor with a bittersweet afterglow. Or you can try Pitsillides’ version of Keftedes ($10), chopped veal and pork rolled, rounded and fried into miniature meatloafs oozing with onion bits and spiked by cinnamon. The Cypriot cabal is surrounded by yogurt and herbed salad. Watch out for kappari: capers with tiny thorns. I shall not mention the Rabbit Leg Braised with “Mountzentra” ($23), nor allude to the Katsiki Goat Stew ($25), except to say they are accompanied by either lentils and luscious fried onions or crispy okra and wheat berries, and you may acquire a taste on the spot, or not. Desserts or “Glika” are sweets which may be sampled by ordering the Daily Assortment of Traditional Cypriot Pastries ($8/$12). They range from a phyllo-dough-perimetered mixture of nuts and dates, fig-cookies, syrup impinged baklava and halva. Uniquely stylized and elegantly presented, you find your palate at the Petra tou Romiou, the rock where Aphrodite was born.